Well hello!! I am back. Did you miss me?? I've been traveling with my sweet hubby last week, so there was nothing creative happening on the home front. We traveled to North Carolina and let me tell you IT. WAS. COLD! 28 degrees at night. But we did see some pretty countryside. Lots and lots of green fields everywhere, especially on our return trip, as we took side roads instead of driving all the way on the Interstate. I was totally enamoured with these beautiful trees. Can someone tell me what they are?? They were in full bloom everywhere. And I have a 4 star recommendation for a restaurant in the Greenville North Carolina area. Do NOT pass up the chance to eat at Rucker Johns if you ever come across it. They apparently have three locations in North Carolina, so be sure to look them up if you are passing through. I hope you will have a great week. We have a lot on our plate these next couple of months, so quilting may be on the back burner for a while. But you just never know when the sewing machine will call my name. A preview of the staircase quilt. This is what was hanging during the Christmas season. The Spring Quilt is quilted but does not have binding yet, but I could not wait to see what it would look like, hanging from this spot. I think it will be perfect!! Yay! And the winner of the March Madness giveaway is - Barb Corbitt (no blog). Please send me your mailing address, and I will get your owl package in the mail. Here it is........... this is what I've been working on. I love this Island Batik fabric. The browns and greens look like trees, and I felt this would be such a great Spring Wall hanging to hang on my staircase. Still have the quilting to do, but these fabrics are so refreshing. I've got my next bundle ready for another go around. These fabrics are just so rich. My little point and shoot camera does not do it justice but I wish you could see the depth of color. I would like to introduce to you a beautiful line of fabric that has taken my breath away. I acquired two bundles of Island Batik fabrics and was so impressed with the depth of color and the quality of the fabric. Island Batik currently employs 80 to 100 community members who transform the white base cloth into the spectacular designs and colors for which Island Batik is known. All of the fabric dyeing is done in our own manufacturing facility in Bali, which is centered in a small village. Men and women of the community perform the management of the plant, as well as all of the production processes. Men perform the stamping of wax onto the fabric, dyeing, washing and drying. The fabric is left out in the rice fields, where good sunlight is essential to ensure strong color and color fastness. The women are in charge of quality assurance, folding, bolting and packaging of the cloth. Island Batik is also a sponsor of Quilted in Honor. There are several free pattern downloads on their website. You will find challenges and giveaways on Island Batik's website and blog. The first bundle I worked with was this green and brown collection. Do you see this gorgeous detail?? I am working on a Spring wall hanging, which will have a woodsy look to it. I'll share what's on my design wall in the next day or two. I hope to keep you up to date on their new spring lines. Be sure to stop by the Island Batik Blog and enter their current giveaway. Are you a basketball fan?? I've never been one to watch much sports, but March Madness is upon us, and my sweet hubby's team is in the running. Yes, he's a Gator fan, so watch out for those choppers. For me, I'd rather be sewing or quilting. This is the closest thing I've ever come to cheering his team. I made these for a friends daughter who attended the University of Florida. Handy to carry around when you are in the bleachers. But for today I thought I would have a little giveaway. I found these very cute owl fat quarters and wanted to share them with one you! I couldn't resist the little wide eyed note pad. And there is a one yard cut of coordinating fabric to go along with the little hooters. Leave a comment on this post, telling me if you have a favorite basketball team. And if you have ever been to one of their games. I'd love to hear about it. The most fun I ever experienced was attending a Harlem Globetrotters game years ago. Wow. they were amazing, and so fun to watch. If you are a follower of my blog, leave a second comment letting me know how you follow. 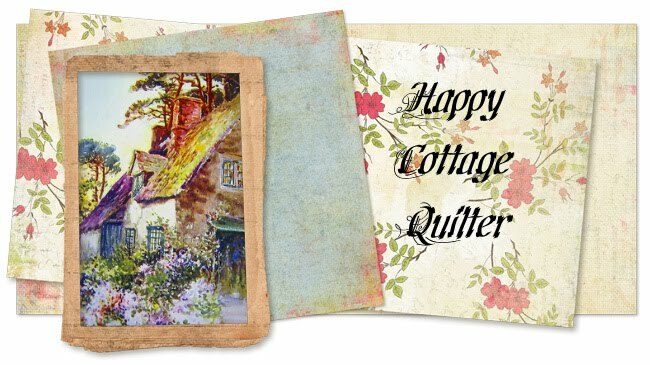 You can also find me on Instagram :-) Just type in happycottagequilter and it should pop right up. The giveaway will be open until Sunday March 23rd. Oh and be sure I have a way to contact you. A no-reply comment does not qualify. Have a great day, and Happy Quilting! The work on my batik project came to a stall last week, when the light in my sewing room started to waver. It's been difficult to see, with limited lighting, but my sweet hubby will change out the florescent bulb today. However, I did manage to start working on piecing the pretty green fabric I showed you the other day. I know, I know it's not much, but I'm hoping to get moving on this once my lighting is restored. If you have never worked with Batiks before, I found this interesting video on the process of making batik fabric. There are NO machines involved in making these beautiful designs. I was totally amazed at the extent of this process. It is no less than an art form. And if you are wondering why my blog has been slack these last couple of weeks, the glories of Spring are beckoning me. Okay, truth! Where would you rather spend your time?? Years ago I used to use Connecting Threads Variegated threads. They were discontinued a couple of years ago, which was very very sad. You asked, We listen! And they are carrying the Variegated threads again! And a pattern birthing in my mind for these Island Batik fabrics.